Pat, one thing you forgot is the Tigers are in the Central so they have time to get it right. I think at the trade deadline you will get more of a choice and maybe we won't have to do a trade. You can go with Coke and Dotel split for the 9th until Benoit heats up. This also allows AA nd BV to develop into the 7th inning role. I alway thought to bring Rondon along slowly such as AAA closer in Toledo or 7th inning reliever. If he gets it right then bring him for the 8th inning and so on. Procello is too talented to be a reliever even though he is a one-pitch pitcher right now but he should be able to develop three pitches. This a classic example of rushing a pitcher to the MLB. Did they not learn from two pitch pitcher Bonderman. Jim Price said on a recent broadcast, that he believes, DD will bring in a closer probably, from outside the organization via trade, once they determine that Rondon isn't ready. by committee will be ruled out. Repeat 1984? Tiger fans can hope. surprised that you don't see anyone on the roster being able to handle closer. Benoit seems the most likely choice to me. The main question with him is whether the HR prone ways of last season were a fluke or enduring problem. Regarding Coke, rare for a lefty to be full-time closer in MLB. those that do usually have dynamite stuff. One pitcher that should be available this season is Betancourt in Colorado. closed for the first time last year and has a couple of seasons of playoff experience. What fun would Tiger baseball be in this Milleneum if the Tigers didn't have a closer who scared the crap out of fans in the ninth - allowing men in scoring position and the tying run to get to the plate. I thought "rollercoaster" was part of the job description. The sad part is, Valverde would probably come back this year and do a great job - but there is no apetite for his antics anymore. 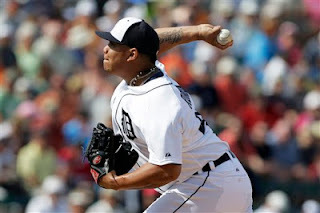 But certainly Rondon is not ... yet ... the answer.